Create smart and flexible chatbot surveys. Choose from over 12 question types that respondents can answer within Facebook Messenger. Check out all question types. Create surveys for your own Facebook pages. 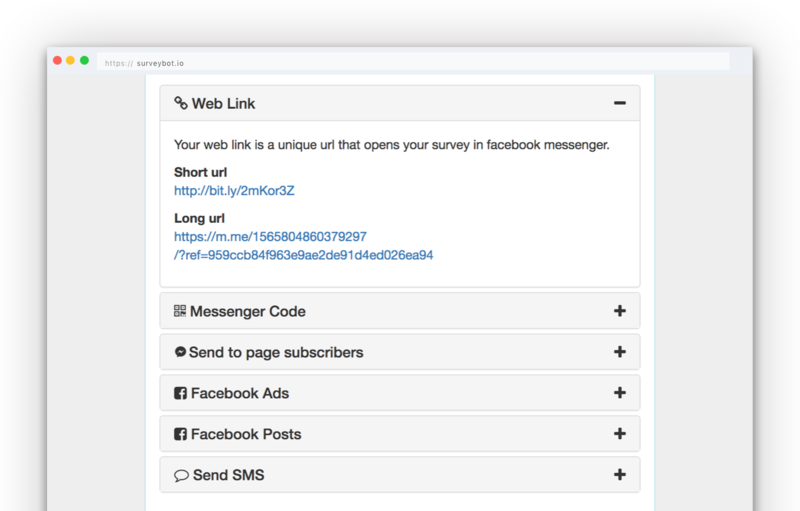 Start your survey automatically when someone chats with your page or give respondents a unique link to your page to start your survey in Facebook Messenger. Humanize your surveys by adding messages in between your questions to make your survey more conversational. Add conditional messages to send messages based on previous question responses. Create your surveys in any language by entering your own content. Customize error messages and page actions to ensure your survey is in the language you want. Set your surveys to be anonymous so you can't see who your respondents are. Send an image with your question to ask respondents about the content. Add merge fields to questions and messages to include respondent attributes like their name. Setup keywords so that respondents can restart at any time. 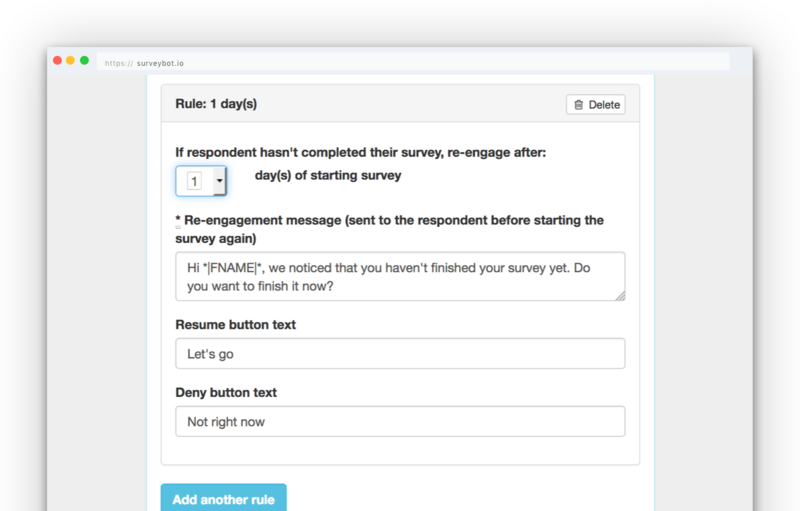 Get email notifications in real time when respondents complete their surveys. All question types are validated in real time to ensure your data is valid. Setup custom error messages for when an invalid answer is sent for a question. Drag-drop re-ordering of questions makes it super simple to build your surveys. Start your survey automatically when someone opens a conversation with your Facebook page. Configure how your survey should handle when a respondent returns to resume or start again. 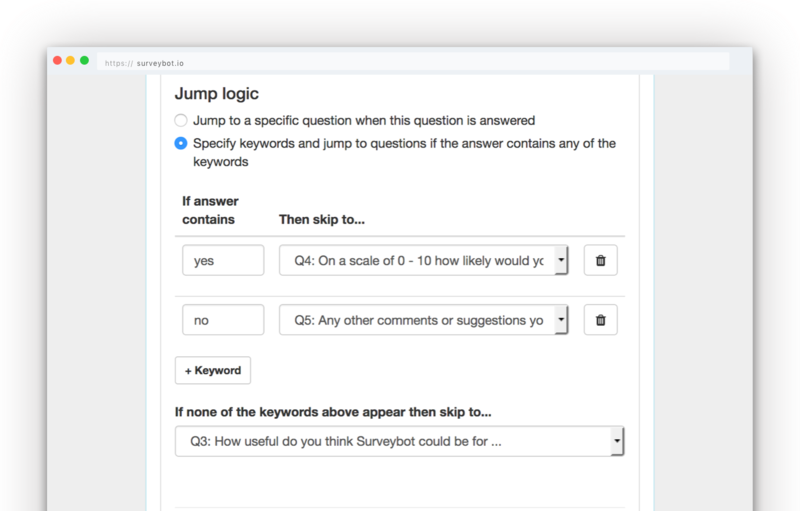 Add jump logic to your questions to control which follow up question to go to. Add jump logic based on keywords that appear in open ended questions. Pipe answers from the previous questions in to the following questions. 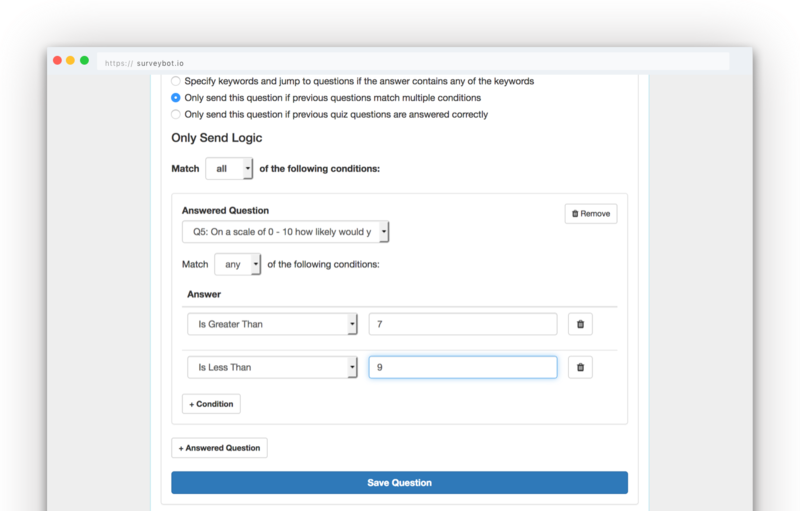 Enables you to only send a question/message based on answers to previous questions. 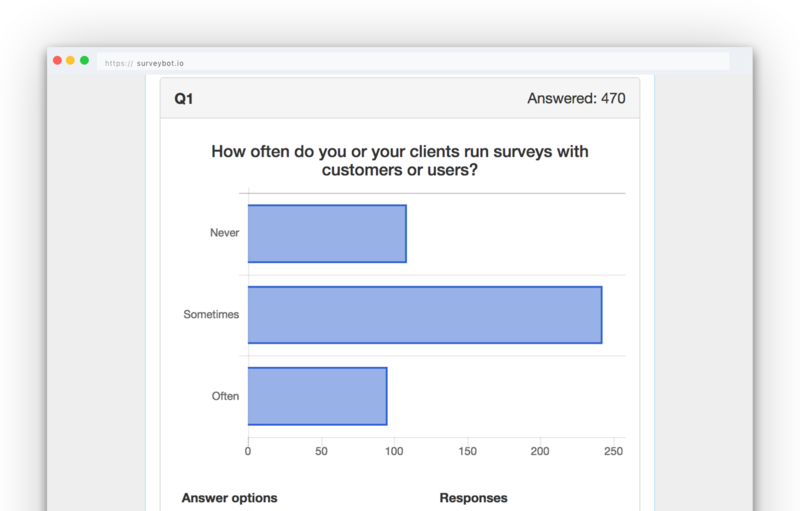 Qualify respondents in realtime before sending the question/message in your survey. Add as many only send conditions as you want to your questions. Evaluate previous answers with multiple conditions per answer. Set correct values for answers to score them. Only send follow up questions/messages based on the total correct answers. Qualify respondents in real time based on their total score. Re-engage respondents who don't complete their surveys to help increase completion rates. Specify the period for when the message is sent. Add multiple message at different periods to ensure your survey is completed. Customise the message that is sent to your respondents. Customise the opt in buttons to get the respondent to start or deny the re-engagement message. View summaries of question answers including charts for multiple choice question types. Export completed or incomplete survey responses to CSV at any time. Integrate with all your third party apps without the need for any coding using Zapier, Data API or Webhooks. Each survey has it's own unique link to start in Facebook Messenger, a short link also included. A unique messenger code is created for every survey so that respondents can scan and start their surveys. Send your surveys directly to your subscribers over Facebook Messenger. Create Facebook Ads to acquire responses from your own targeted audiences on Facebook. Create Facebook Posts to acquire responses from your Page audience on Facebook. Use SMS short codes to get your survey distributed to your existing audience members. Link question answers to Panel subscriber attributes e.g. email address. 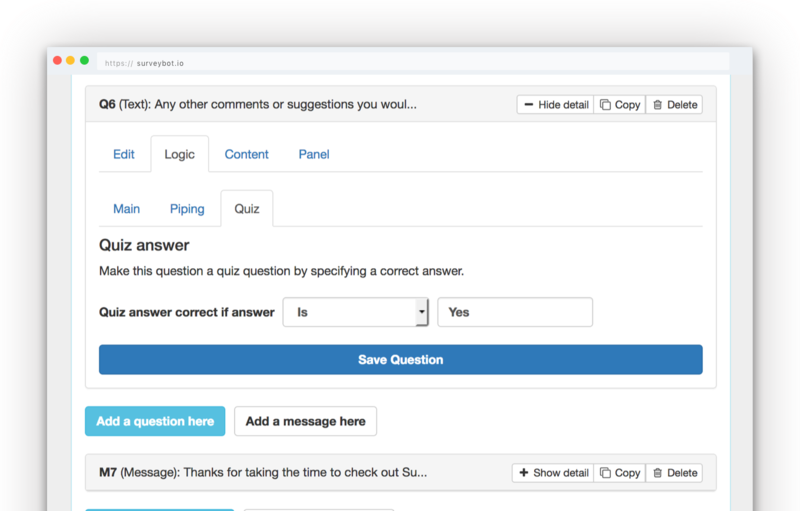 Automatically fill answers to Panel questions if the respondent already has the information in their profile. Integrate your survey response data in real time with your CRM using Zapier, Data API or Webhooks. 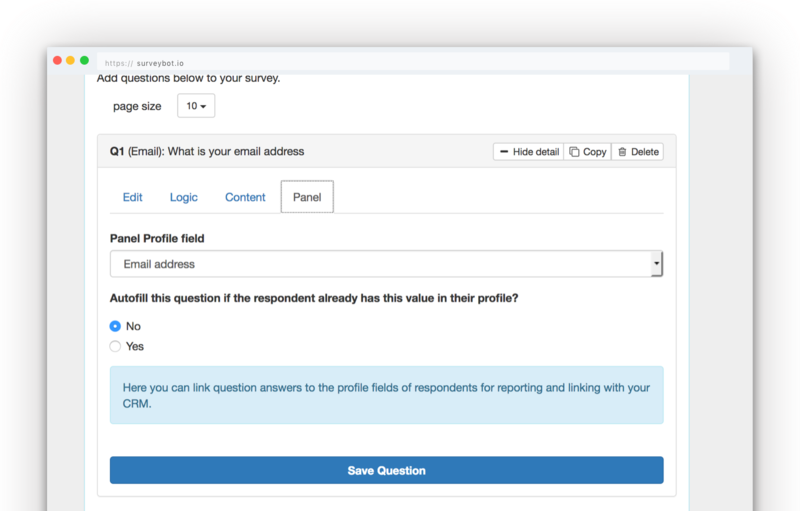 Browse your individual responses within Surveybot.